LTTE’s arms dealer sentenced in U.S.
Oct 31, ColomboPage: A Singaporean arms dealer who was charged for conspiracy to provide material support to the Sri Lankan LTTE Tiger terrorist organization has been sentenced to 37 months in prison by a U.S. federal judge yesterday. U.S. District Judge Catherine C. Blake sentenced 57 year old Haniffa Bin Osman of Singapore to 37 months in prison for conspiracy to provide material support to a designated foreign terrorist organization and money laundering, U.S. Attorney for the District of Maryland Rod J. Rosenstein announced. A media statement released by the US Department of Justice yesterday says from April to September 29, 2006 the accused conspired to supply the Tamil Tigers with state-of-the-art firearms, machine guns and ammunition, surface-to-air missiles, night vision goggles and other military weapons to be used to fight against Sri Lankan government forces. In 2006, Osman has told the undercover agents in Baltimore that the weapons were for the Tamil Tigers from Sri Lanka and the Tigers had wired a deposit of $250,000 as a down payment for the purchase of the weapons. The other conspirators, Indonesian nationals Haji Subandi and Erick Wotulo and Sri Lankan Thirunavukarasu Varatharasa have pleaded guilty and been sentenced earlier. THE MINISTRY OF DEFENCE in cooperation with the Central Bank of Sri Lanka is building 50,000 housing units for armed forces personnel. The project is phased over five years, with 10,000 houses to be completed each year. Already 1620 housing units are being built in Ipolagama, Anuradhapura and are expected to be completed within six months. Stage two is expected to begin in Horowpathana. Each housing project also includes schools, shopping complexes, gymnasiums, and other facilities. These, along with new roads and other services will ensure that the surrounding region will also benefit from significant infrastructure development. 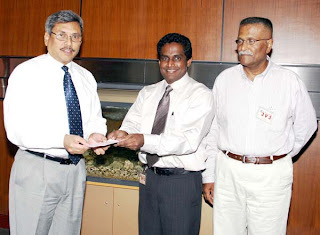 The Sri Lankan Welfare Foundation-Calgary in Canada, made a monetary donation worth USD 6000 to the 'Api Wenuwen Api' housing project during a visit paid by its representatives to the Ministry of Defense, Thursday(Oct 16). The generous contributions to this donation have been given by Sri Lankans living in the city of Calgary and in neighboring places. The cheque was presented to the Secretary Defense Mr. Gotabaya Rajapaksa by the consortium representatives Dr. Lasantha Gunasekara and Upali Perera. The Sri Lankan Welfare Foundation - Calgary is an organization of Sri Lankan expatriates with its administration office based at Calgary in the province of Alberta. Currently various fund raising activities/events are organized within the city of Calgary for the welfare of all Sri Lankans. The 'Api Wenuwen Api' housing scheme is a mega project for building 50,000 housing units for war heroes in the phase of five years initiated by the Ministry of Defense. We are happy to note that despite the pressure being exerted by pro-LTTE political parties in Tamil Nadu, your government has chosen not to intervene to stop the on going military operations that the Sri Lankan government is conducting against the terrorist LTTE. As you are no doubt aware, if the LTTE is allowed to continue with it’s blood thirsty campaign to separate from Sri Lanka, the resulting destabilisation of Sri Lanka will have a negative impact on South India and even lead to the strengthening of the Tamil separatist movement in Tamilnadu. India is rightly concerned about the plight of the Tamil people. The Government of Sri Lanka too, is concerned about the plight of the Tamil people, who are citizens of Sri Lanka. The GoSL is concerned by the fact that these people are being held hostage to be used as a human shield and cannon fodder by the LTTE in the areas that they illegally occupy. As articulated by Senior Members of the Sri Lankan government the Sri Lankan military is following a policy of zero civilian casualties. The fact that this policy is not merely restricted to words is clearly demonstrated by the very small number of civilian casualties that have occurred in the more than two years of military operations conducted to liberate the east and the north of Sri Lanka from the LTTE. Furthermore over the years successive Sri Lankan governments have provided all the essential items such as food, medicine, educational items, electricity, telecommunication facilities, electricity, teachers, doctors, government administrative staff to the people living in areas under illegal occupation by the LTTE and have paid the salaries of all government staff working in those areas. This is done despite knowing full well that the LTTE seizes most of the items sent to those areas. Hence despite gaining little publicity and almost no praise for it’s unique policy, Sri Lanka has consistently been looking after all of it’s citizens even if they live in areas under the illegal occupation of the LTTE and irrespective of their ethnicity. On the 22nd of October 2008, the LTTE attacked a convoy of ships carrying food to the North. A UN convoy of trucks carrying food to the people in the war zone turned back when the LTTE began firing at them. These actions do not show any concern for the people who are supposedly trapped because of the fighting, but, are, in reality being held hostage by the LTTE: one to give credence to their lies that the armed forces are targeting civilians, two: to enable them to use civilians as a shield when falling back from their positions of defence and three: to use the civilians as labourers to dig their trenches and as a last resort to be thrown into battle while trained cadres make good their escape. In addition to the government’s programme of providing assistance to the IDP’s, many locally founded NGO’s are working on a plan to supply all if not most of the needs of IDP’s who manage to escape from the clutches of the LTTE. The local NGO’s hope to obtain the required items in the form of donations from the general public of Sri Lanka. This act while augmenting the government’s efforts to protect and assist these IDP’s also serves to foster harmony between the Tamil and Sinhala people of Sri Lanka. In short the government and people of Sri Lanka from all ethnicities are doing their utmost to free their Tamil brethren from the stranglehold of the LTTE. Over the last twenty years the LTTE has thrown away all of the opportunities that came their way to resolve this issue in a peaceful manner and used the ceasefires that accompanied each attempt at a negotiated settlement as a cover to re-train, re-group and re-arm themselves. The Indian Peace Keeping Forces felt the full brunt of the LTTE’s brutality as well as their intransigence during their brief sojourn in Sri Lanka in the late eighties. The LTTE has demonstrated their lack of sincerity and lack of interest in finding a solution that doesn’t violate the territorial integrity and sovereignty of Sri Lanka and has proven time and again that they are the only impediment to bringing about a peaceful resolution to this conflict. President Rajapakse’s government has shown good faith by appointing a former child soldier as the Provincial Governor in the East of Sri Lanka once it was cleared of the LTTE and elections could be held. He has also given a former terrorist, who repudiated terrorism for a political solution, a seat in Parliament. This goes to show that, had the LTTE been interested in a political settlement, the Government of Sri Lanka was ready to meet them half way. The LTTE has left the Sri Lankan government no choice other than to militarily destroy them in order to restore democracy in areas illegally occupied by the LTTE and to free all of Sri Lanka’s citizens from the terror of the LTTE and to obtain the space to address all their grievances and aspirations without violating the territorial integrity and sovereignty of Sri Lanka. It is in India’s interest that Sri Lanka remains a unitary, undivided state, to ensure that India too is not forced to succumb to the demands of the various separatist movements that are raising their heads on Indian soil. It will also be a deterrent to the rise of a greater Dravidian state, which seems to be the dream of some politicians. 3. To publicly urge the LTTE to allow safe passage into government controlled areas for the people that they are holding hostage. Asserting that problems couldn’t be solved by military means, UNP MP Vajira Abeywardena recently attacked the ongoing military campaign against the LTTE. The Galle district MP emphasised that wars wouldn’t produce any winners. Addressing a public gathering at Kaduruduwa Methodist Church, at Akmeemana, he said that only idiots and lunatics would believe in a military victory. He said that as Buddhism would never approve of war, the ongoing military campaign should be called off immediately, to pave the way for a negotiated settlement with the LTTE. He urged the government to make a genuine bid to resolve the crisis and said that the country could no longer afford to continue with an increasingly costly war. The MP said that people shouldn’t gloat over the killing of combatants. Only the wretched could be happy over battlefield deaths. He said that UNP leader Ranil Wickremesinghe firmly believed in a negotiated settlement. Chief UNP organiser for Akmeemana and Southern Provincial Councillor, Wijepala Hettiarachchi warned the government of the danger in antagonising India. Accusing the government of keeping the people in the dark, he said the three decade old war was now in its most dangerous stage.